Home » Flash Sale » Blast from the Past – a Midweek Flash Sale! 40% Off Storewide! Blast from the Past – a Midweek Flash Sale! 40% Off Storewide! It’s been awhile, Forklift Fans, but this week, on Tuesday – Thursday (September 22-24, 2015) we are bringing back the MIDWEEK FLASH SALE! Take 40% off the blue and orange price tags on modern and vintage items. Sale does not apply to lumber, items with missing or damaged price tags, select specialty items, Salvage Arts antiques, Amazon Recycled Paint,Treincarnation raw-edge lumber, reconditioned appliances from Alco Repair, or upcycled decor and gifts from Tanglewood Works. May not be combined with other sales. Come see us this week and find yourself a bargain! 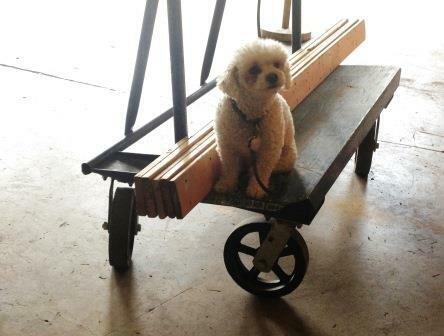 At the Forklift, even our four-legged friends are into reuse.